just for a short glance. My first attempt at adding a photo -- North Shore of Superior at Tettagouche State Park -- and a large number of those "familial" rocks live in my house and yard [and car and backpack and jackets]. So... just moved one more tiny degree forward on the blogging learning curve. YEA!! all who are seeking Him. Of what am I afraid?? My friend, Susie, asked if I would post this as she is going to put something that will link to it. [I don't understand all those things very well, yet, but I just try to go along with the program...] I wrote it back in October, '01, while I was hiding out on the North Shore of Superior, trying to deal with brokenheartedness connected to 9/11's life and death. Much of my writing during those days was very serious, very dark. This was one of the only light pieces, and I've enjoyed sharing it with friends and family over these years. beautiful scenery in other places in the world ... this one is "it" for me. A couple of my sisters who live in the Northwest have told me before that when they see the Mountain in all its glory they think of me and how much I would enjoy that particular sight at that particular moment in time. I have lots of photos of the Mountain, but even the best of them lacks the true reality of the view. 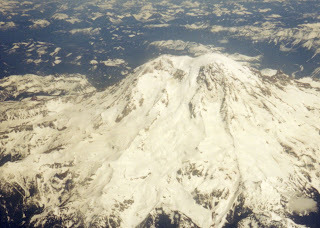 Back in March, 2003, while I was visiting in Tacoma, a time when seeing the Mountain is not so frequent because of the cloudy spring days, I was seldom able to have the blessing of seeing it. However, there were a couple of times... and I wrote some less than wonderful prose/poetry about it. But decided that I would pop it your direction and you can laugh/roll your eyes and wonder about my addictive personality -- well not "wonder" about it, but have it proven once again. sans poles and power lines. I’m not sure why any of this is true. I find with every encounter.